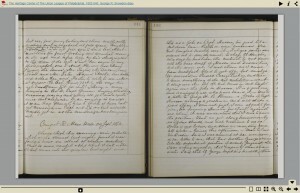 Click the image to view the Tanner Manuscript in a page-turning viewer. In 1865, Corporal James Tanner was a disabled Civil War veteran working as a clerk in the Ordnance Bureau of the War Department and living in an apartment next to the Peterson House in Washington, D.C. On April 14th, President Abraham Lincoln was shot during a theatre performance at Ford’s Theatre. The mortally wounded President was taken to the Petersen House. Because he had stenography skills, Tanner was called into the Peterson House. 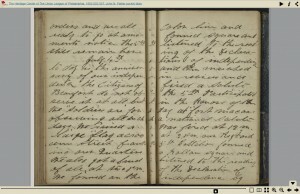 While Lincoln lay dying in the bedroom, Tanner sat in the parlor and recorded eyewitness testimony as given to Secretary of War Edwin Stanton and David Kellogg Carrter, Chief Justice of the Supreme Court of the District of Columbia. 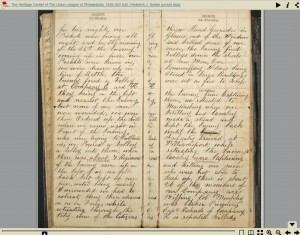 The interrogation of the witnesses took place between midnight and 1:30 A.M. “In fifteen minutes I had testimony enough to hang Wilkes Booth, the assassin, higher than ever Haman hung” noted Tanner. 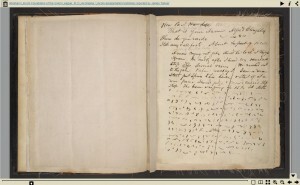 While still in the parlor, Tanner transcribed his shorthand notes into longhand, finishing his task at 6:45 A.M. Tanner returned to his apartment and, dissatisfied with the quality of the first transcription, began a second copy which he left with an aide of Stanton’s at his office in the War Department. Tanner retained the original testimony. The copy deposited at the War Department was lost. 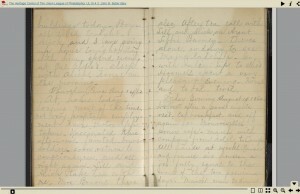 In 1905, Tanner’s son took his father’s first transcription and mounted each sheet on linen and bound them.